A traditional birth attendant, Yetunde Osin and her father have been arrested for allegedly stealing a 2-month old baby girl from her mother. 35-year-old Yetunde Osin and her father, 65-year-old Jamiu Jimoh were accused of being a part of a child selling syndicate by Police detectives from Igbogbo Police Station in Ikorodu Lagos. It was learnt that Osin delivered the baby for a 28-year-old woman named Stella on the 9th of November at her home at 4 Kadara street in Oyingbo. She was said to have told the woman that the child was dead and even showed the mother a dead child. She then brought the baby to her father in Ikorodu. After her arrest, Osin disputed the story, saying she found the baby under a bridge near her Oyingbo home. 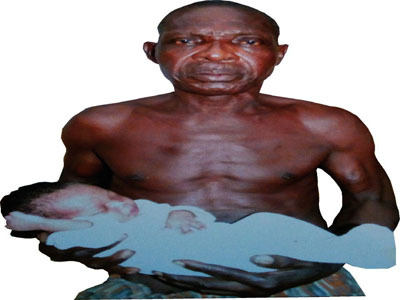 Her father who lives at 4 Aro street in Ikorodu also denied having knowledge that the baby was stolen. The mother of the stolen baby is yet to come forward. I don’t believe father and daughter. Not in this country a baby will be dumbed and nobody in the area will be aware of that. The media will also make it known to the public. She needs to say the truth, so that the baby can be given a proper care by the mother. WHEN U FIND A BABY BY THE ROAD SIDE, WHERE DO U FIRST TAKE IT TO? If the mother of the baby comes forward, the truth will out.